I like the flow and the increasing ease of your writing...a good indicator is that the number of superfluous details / description continuously decreases, so that you are ultimately left with an elegant and compact post, which makes (almost)as much sense to the reader as it does to you! It was a great read! makes me want to read this book, which I'll!! @вєѕρє¢тα¢ℓє∂_ωαи∂єяєя - Ah, pretentious!! That's the exact word I was looking for!! Don't you hate such places? p.s.- am waiting for the whole 'weariness' post too.. stalking you regularly, mind you!! :D keep it coming! Haha, yep same with me! Though I hate the whole package you know..I guess the more it costs the less it is in quantity! 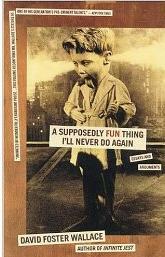 Well since you probably won't live to tell if you liked it or not; yep, that seems like an 'only supposedly fun thing'! Your flow of thoughts seem straight from ur heart and you seem to have a good taste for literature. You sould write more. Well, thank you! I'm working on that; being more regular, that is!